Hi, I think this is the right forum for this. 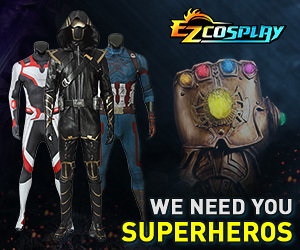 I often visit Cosplay.com while at work (terrible I know) and recently whenever I use the Forums link for the first time the page goes to an ad rather than forums. If I used the Back button it then goes to the initial Forums list page. I'm using IE10 but have been for a while without seeing this issue. The ads I'm being routed to aren't even full-page ads, but more like regular sized ones getting their own separate page. Some have even been broken image links. I'm not sure what there is to do about this and I've got the workaround with the back button but I wanted to let you know something may be up with your ads. That's odd, thanks for letting me know as it's the first I've heard of this happening. Is it just an ad blocking the forum display (as in the browser URL shows cosplay.com's forum URL but the ad is showing in its place), or is it forwarding you off of the website to the ad? Also if you can tell me what the ad is for, I can check the 3rd party ad server to make sure they didn't mis-categorize a specific advertisement. Any ad like that should be blocked 100% by default on a site-wide level. I was checking from home and it didn't seem to be an issue there (where I use Chrome), but as of this morning it's not an issue from work either. I'm not sure if the ads fixed themselves or got removed from rotation. At least one of them was a Comcast/Xfinity ad I'm pretty sure, but I have no idea what the ones with broken image links were. And I believe the URL still showed cosplay.com when they showed up. If it starts happening again I'll try to get more detail. It only tended to happen once a day from work, once I'd gotten past it the first time it didn't happen again until I restarted my computer at the end of the day. For the first time, I got the page-blocking ad after having already visited the site. The URL shown was [url]http://www.cosplay.com/forum.php[/url], but the page was just an ad for Comcast Business Internet. I've attached a screenprint of the page. and I'm making a new post to add the new attachment. This time the image was broken for the ad. Thanks, that shouldn't be happening and it's just a standard ad. This is the first time I've ever seen it happen, but I'll check into it as it might just be something in the way the ad is loading. If anyone else has had this happen, please let me know. Here's the new attachment with the broken image ad. Thanks, and that's only happening in IE10? So far it's only happening in IE10 but I actually tend to do almost all of my CosCom viewing from work where we're required to use IE10 so that's not really saying much. I'll have to test it more at home where I use Chrome to confirm.